For over 4 years now the Eco Group have been recycling the contents of First Aid Kits ‘rescued’ from a local company which services off-shore life rafts. Survitec very kindly allows us to take the kits and sort out the contents which are then sent to either Intercare (www.intercare.org.uk) or Famine Relief for Orphans in Malawi (fromscotland.org.uk/‎). 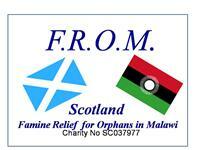 We have also sent quantities of items to Burundi and to our twin church in Khyakhula in South Africa. We are fast approaching a total of £50 000 of First Aid equipment. This would otherwise have gone to landfill. Our local Rotary Club is also involved in a similar project with kits from another company which they sort, and then donate to us for dispatch to our usual charities. We now also have St Phillips Church in Joppa near Edinburgh on board. 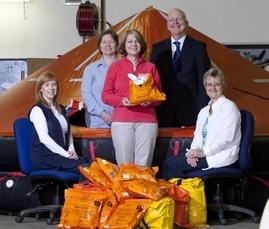 They receive kits from Survitec’s Leith branch. The items recycled from these kits go to a project in Tanzania supported by the local Roman Catholic Church in Joppa. We are working on setting up other recycling projects in other towns around the UK. The Eco display at Trinity is about the First Aid Kit Recycling. Come and have a look. Earth Hour is the world’s biggest celebration for our amazing planet, hundreds of millions of people from across the world coming together in a symbolic and spectacular light outs display. In 2014, this will be for one hour from 8.30pm on 29 March. (Our Annual Stated meeting starts at 7.30pm, we will then have pudding and then start our Earth Hour at 8.30pm). Why not join us at Trinity Church Westhill for out Candlelight Service and celebrate God’s Creation with Praise, Prayer and Pudding! Eco Congregation produce a very interesting Newsletter Click on this link to read about what else is going on in Scotland in other Eco Congregations including Skene. 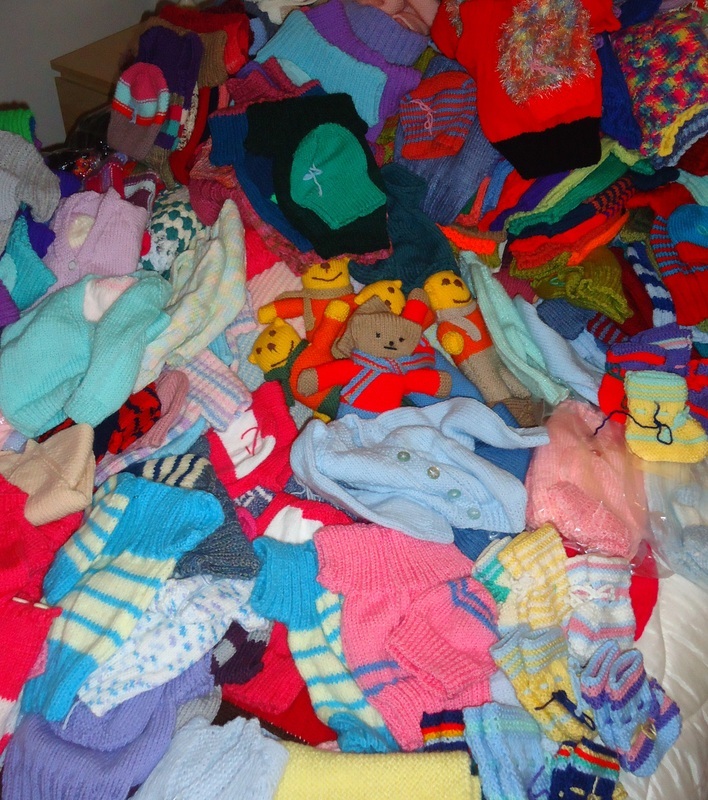 Thank you to everyone who has knitted the beanie hats and jumpers for the 'fish and chip babies'. Due to the tremendous response to this project, the Eco-Group would really appreciate if you were able to knit other items which are so needed. Every day babies are born into extreme poverty in Africa. You can help to give newborn babies and children in Uganda, Kenya and South Africa a better start in life. You can help by knitting a baby hat, cardigan, teddy or cot blanket for these babies, so that they can go home wrapped up warm and with proper clothing, and even a small toy! The items themselves are easy to knit, and help give a child a much better start in life than they would otherwise have. The patterns can be downloaded as a PDF file directly from the Greenfields site Please click on the latter. We will be collecting knitting during the month of September (2014) - please appropriate boxes at either Skene or Trinity Churches. Donations can be handed to any member of the Eco Group or can be handed in to the Church Office. Thank you so much! We raised over £200. Thanks to all who attended. The monies raised will be used for future ‘eco improvements’. Four Aquaboxes have been purchased from Westhill and District Rotary Club by three Skene Parish Church Groups. 1st Skene Boys' Brigade bought and filled two boxes and 1st Girls' Brigade and the Eco group each bought one. The Boys and Girls Brigade Seniors have completed this task as part of their badge work.The Standard AQUABOX comprises a robust rigid plastic container and includes an AquaFilter Family that will provide sufficient drinking and general washing water for a family of six for well over a year. Over 18,000 litres of potable water that is capable of meeting the needs of a family of six for well over a year. 2 Survival Bags are included for the family to use to either sleep in or to gather all their belongings into when they first receive the Aquabox. Humanitarian Aid that will enable the victims of the disaster to begin to rebuild their life and to give them some dignity in their hour of need. The humanitarian items which are suggested in the box have been collected by the groups from friends, family and members of the congregation. The boxes when full are sent off to a central collection point co-ordinated by The Rotary Club of Wicksworth. Once at their central warehouse in Cromford, the boxes are then shipped either by aid agencies or direct by us to areas of need in the most appropriate way. The box itself can be used by the recipient family for many years to come, for example as a vermin proof rice store. 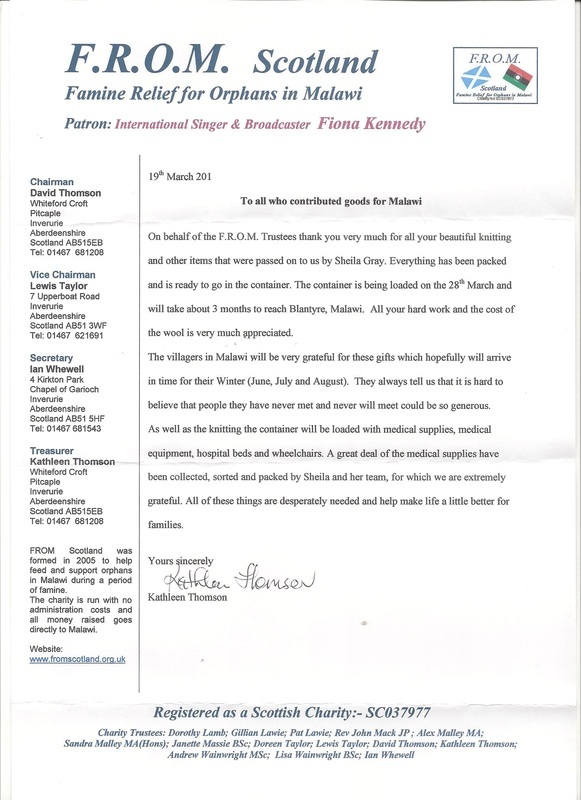 The groups would like to thank everyone who has helped to make this project such a great success. Thanks to Ian, our gardener at Trinity Church and the many volunteers, our gardens at Trinity continue to flourish! Skene’s Own Little Bit of the Jubilee Woods! Our hard working team of men, women and children, wielded spades and hammers and had the job done in no time at all – planted, staked and protectors fitted. The work was done under the expert eyes of Alison Sutherland, an Aberdeenshire Ranger and Graeme MacDonald. The hard work completed, the ‘workers were treated to hot drinks and, as we say in the North East, a ‘fine piece’ to eat. The Eco group would like to thank all the volunteers who supported us in this venture. Over the next decade or so, it will be interesting to watch our woodland grow. In years to come, we will be able to bring our children and grandchildren along and show them what we helped to achieve in our little corner of the land. On Saturday 17 November, an enthusiastic group of folk from Skene Parish Church and Skene Primary School joined the Eco Group and gathered at a small piece of land next to Kirk Cottage in Kirkton of Skene to take part in a tree planting activity. Skene Parish Church Eco Group were given a free Community Tree Pack of 105 tree saplings from the Woodland Trust as part of the charity’s Jubilee Woods Project. The Woodland Trust wants to mark Her Majesty The Queen’s Diamond Jubilee by helping millions of people across the UK to come together and plant 6 million trees across the country. The trees, all native species, will grow into a young wood in as little 10 years. Also included in the pack is a Royal Oak sapling, which has been grown from an acorn gathered from one of the Royal Estates. With the Eco Group Funds, new planters have been purchased for both Skene and Trinity. The ones at Trinity are being planted up and cared for by the Anchor Boys, The Girls’ Brigade and the Sunday School. Look out for colourful displays in the months to come. 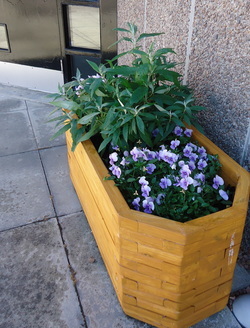 The planters were purchased from Wood RecyclAbility at Pitmedden. Wood RecyclAbility provides meaningful employment in a realistic workshop environment for 45 adults with learning difficulties and minor physical disabilities. In order to provide this service the company accepts deliveries and collects clean uncontaminated wood and pallets for recycling. In 2007 they processed more than 2500 tonnes of wood which would otherwise have gone to landfill. Skene Parish Church Eco Group are delighted to support this worthwhile initiative.